I triple dog dare you to find a more refreshing summer salad than this Greek-inspired bit of yumminess! Prepare watermelon. If not assembling salad immediately, place melon in refrigerator until just before serving time. When you’re ready to serve, place lemon juice into a cup or small bowl and drizzle in the olive oil, whisking constantly. Pour dressing over the melon. Tear the mint leaves into pieces and add to melon. Toss gently to coat mixture with dressing. Add a bit of fresh cracked black pepper if you like a little punch. 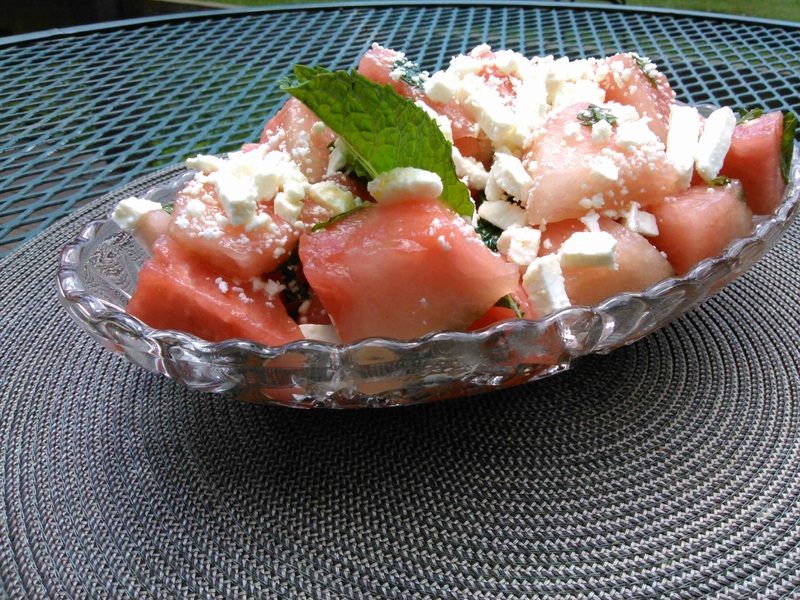 (Salt is not needed–the feta is plenty salty)Sprinkle on feta and garnish with a sprig of mint. This salad is delicious on its own or as a topping for some crisp romaine lettuce.